Four on the Floor String Quartet was founded by Michelle Faehrmann in Vancouver back in 2012, but she's since relocated to Toronto and is hosting a new hometown instalment of her group's long-running concert event, String Fling. The Toronto edition is set to take place on February 2 at the Great Hall, and it will feature a string ensemble comprising Faehrmann, Rachael Cardiello, Kelly Lefaive, Kiana Brasset and Stephanie Chatman, plus arrangements and compositions by Elliot Vaughan. 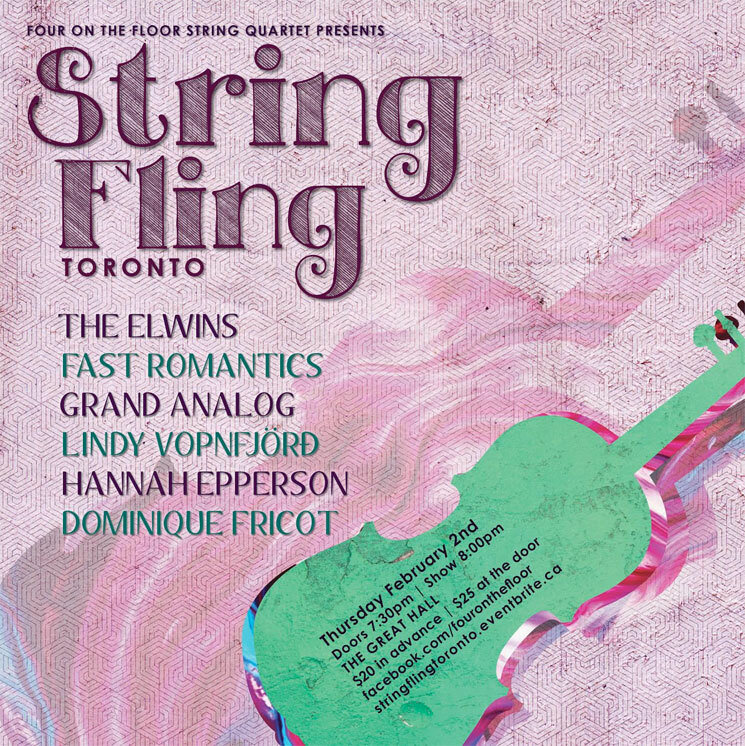 The improvisational, chart-free musicians will be accompanied by the Elwins, Fast Romantics, Grand Analogue, Hannah Epperson, Dominique Fricot and Lindy Vopnfjörd, making for an evening of eclectic musical entertainment all, ahem, strung together by strings. Each featured guest will perform a handful of songs with Four on the Floor, who will also perform original material in between sets. Advance tickets for the event are $20 and can be purchased here. Find full information about the show at the official Facebook event page. Below, watch footage of Mother Mother's Ryan Guldemond performing with Four on the Floor at Vancouver's 2014 edition of String Fling.